That is absolutely mind-boggling to me. So, I’m going to mix things up with this review. I’m going to break it up into specs, likes, and dislikes for easy reading. Big thanks to Vic for sending these over. Durability – That is far and away the key selling point to me. I’ve read that some players went through these sticks in a couple of months, but this pair has lots and lots of life left after many months of regular rehearsals. 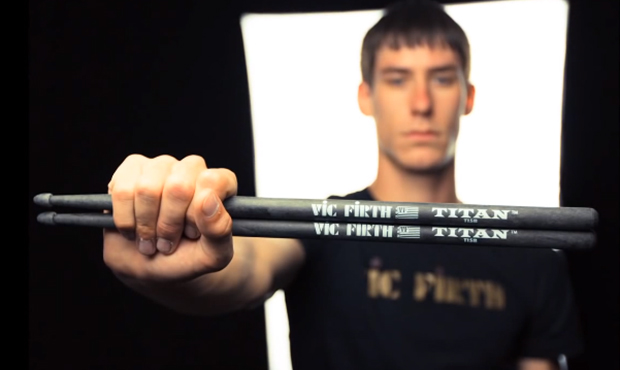 I’ve played other synthetic sticks with this same design, but none were as strong as the Titans. Balance – Compressed carbon fiber feels considerably more dense than wood, so the fact that these are balanced so similarly to Vic’s wood 5A is pretty remarkable to me. They’re a little heavier, but the distribution of that weight feels very much like that of a classic hickory stick. Other synthetic sticks I’ve tried have always moved very strangely in my hand. I didn’t experience any of that here. The Titans have a medium taper with a good bit of front end weight that really makes you play each stroke rather than rely on rebound. It’s a very controlled throw. Rigidity – Unlike some alternatives, the Titans don’t seem to flex noticeably under heavy play. Feel in hand – The finish on the carbon fiber is very comfortable. It doesn’t feel like a hard plastic cylinder. There is the slightest bit of roughed texture to the exterior that adds a kind of fabric-like softness. It’s a great feel. I’ve seen some players refer to the finish as too slick, but I had no problem hanging on to them. Plus, the hollowed out handle really seems to eliminate most vibration coming into the hand. Weight – The little bit of extra weight I mentioned above also acts as kind of a training tool. If your preference is to use the Titans as rehearsal sticks, and then switch back to wood 5Bs for gigs or recording, putting in the hours on the heavier carbon fiber can feel a bit like swinging a baseball bat with weights on to loosen up your shoulders. That difference in weight might be a distraction for some players, but I enjoyed it. Sound – As I mentioned, the Titans are slightly heavier and noticeably more dense than hickory. As a result they pull a brighter, broader sound out of cymbals and drums that are tuned higher. This might be a big positive for some, but I missed the narrower, darker tones created by wood sticks. I’m happy to use them for rehearsals and home practice, but it’s unlikely that I’ll use them for live performance or recording. I will say that the one benefit of long-term use is that the tip has softened just a bit. That mellowed the sound I get from cymbals with the Titans enough to make me like them more, but it’s still not the sound my ear wants. Size – Right now, Vic only offers Titans in 5B. I would love a pair of these in 5A. As soon as they’re available, I’ll probably buy two and be set for practice sticks for the year. Weight – I know I put weight in the positives, but there’s one drawback; while getting acclimated to the feel of that extra mass, I was throwing these sticks pretty hard. It created some fatigue in my hands while my grip adjusted, but that’s expected. I was more concerned about my gear though. Thankfully, I didn’t break anything, but I think I very easily could have if I had been less careful. These are hard and heavy sticks that could be deadly to unsuspecting bronze if used improperly. 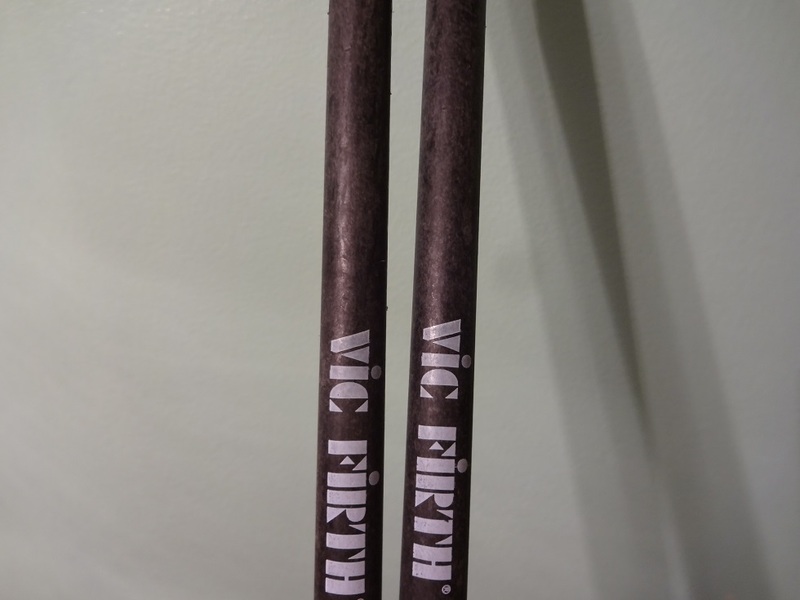 If you’re playing a 5B or comparably sized stick and enjoy bright, cutting tones, Vic Firth’s Titan drumsticks could be a great addition to your bag. If you break drumsticks regularly, these sticks could save you a lot of cash despite their hefty price tag. 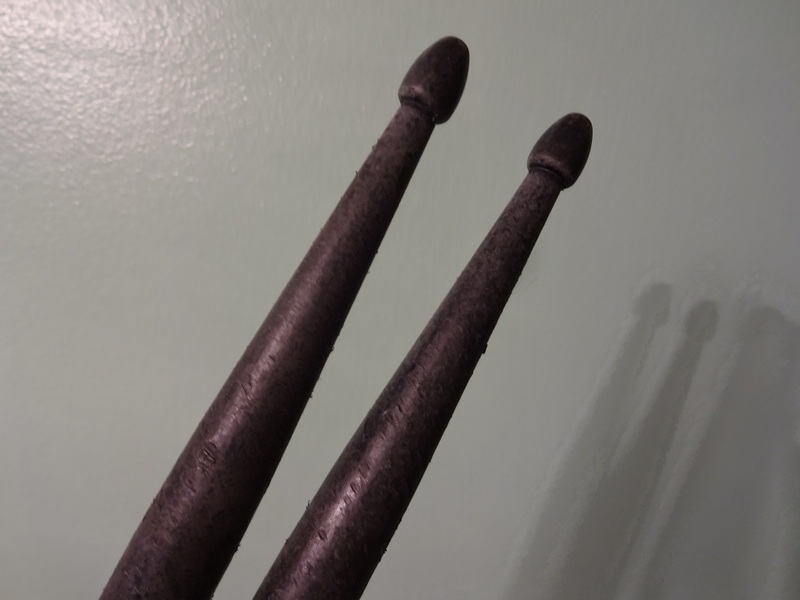 They cost close to or less than five pairs of quality wood drumsticks, and I think they could easily outlast that many for extra hard hitters. They’re a little heavier than you might expect, but they’re comfortable and easy to get used to. Let’s get some different sizes!